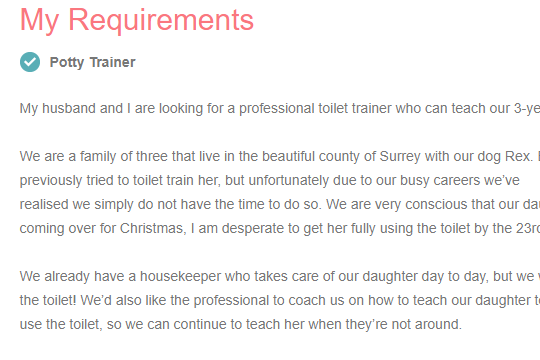 Social media is currently buzzing at the moment with talk of this slightly out-there job advert for a Potty Trainer. (I swear this is real. See here if you want to apply…). At first, I admit, I was a little saddened at the thought of a three year old being looked after by a housekeeper who was not qualified to remind her not to pee on the floor occasionally. A child whose only companion was Rex; a dog who deserved top billing on the job ad, who was probably taught to pee in a designated area. But then I thought I don’t know them or their situation; judge not lest ye be judged and all that. After all, many people use the slightly more traditional help of a familiar childcare provider to help them achieve potty success. 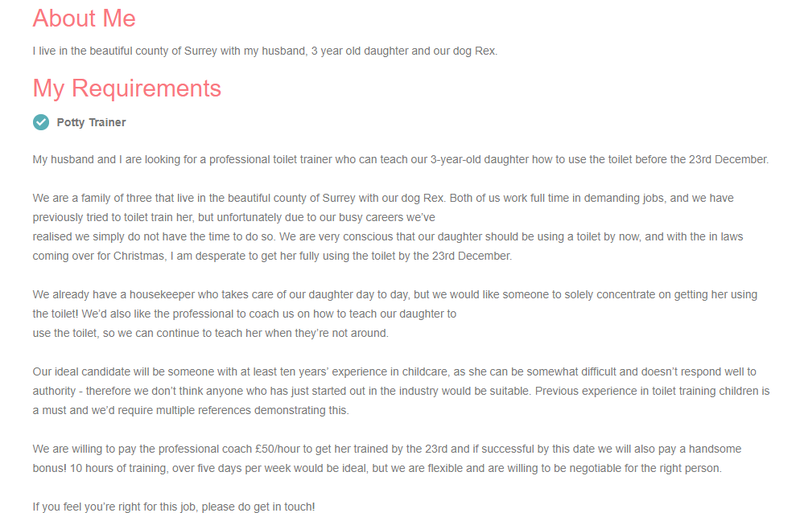 I would love to be considered for the role of Potty Trainer at your fine Surrey home. 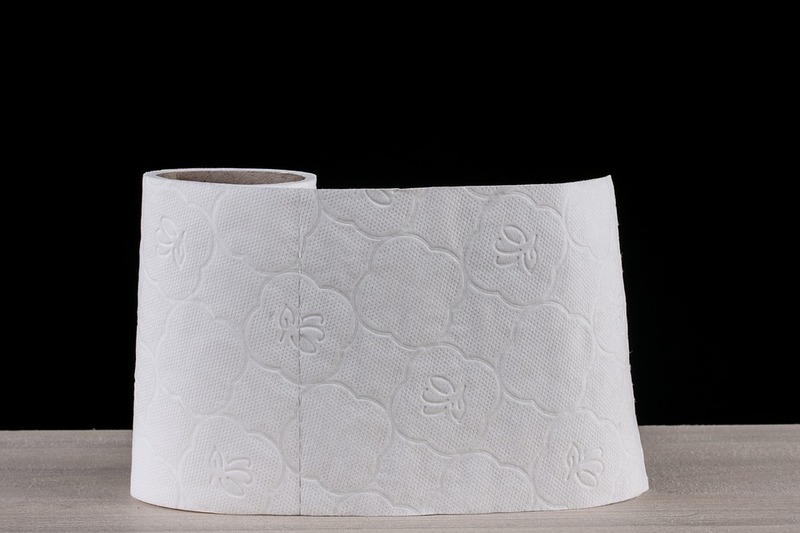 I understand the demands on busy working parents and I know only too well that potty training a child can be source of epic frustration and much after-bed wine drinking, and this is why and I would be only too pleased to put my experience to use. After all, I love helping others and I’m basically over getting bodily fluids all over my clothes and self now. I have successfully potty trained one small female human, as detailed here, who very rarely forgets to go these days. As for myself, I have an entirely clean record apart from once on that trampoline but that was really not my fault. My other small human is not really into it yet but it’s no biggie, it’s just too soon. Whatever. Let’s not go there. For the suggested £50 per hour salary, I will perform multiple readings of Poo Goes to Pooland, I will provide my own copy of Pirate Pete’s Potty and supply as many chocolate bribes rewards as required. I am also happy to watch Dr Ranj’s fab poo episode as often as necessary. Goddammit, I’ll sing the song with a potty on my head if that sweetens the deal. I can’t guarantee that I can get the job done in two hours per day over five days, but as no one else on earth can either, I don’t think this should preclude me from obtaining this revered position. Please, I ask that you do not overlook me on the basis that I do not have the experience required; I may not have ten years’ worth of childcare under my belt but I have been there, on the coal face. I’ve lived this. There is no better testament to my ability to do this job well, I feel. Don’t worry about the ‘problem-with-authority’ thing; I have none, as my children remind me consistently. I have a clean driving license as well as a recent CRB check and I definitely won’t rat you out to your mother-in-law. PS I kind of hope this is a hoax… but if it’s legit do hit me up, I’m good for it. I’d totally eat them out to the mother in law wahahaha lazy rich bastards ? I’ve never heard of this, but its absolutely absurd. what next?